Aleksandr Panin. 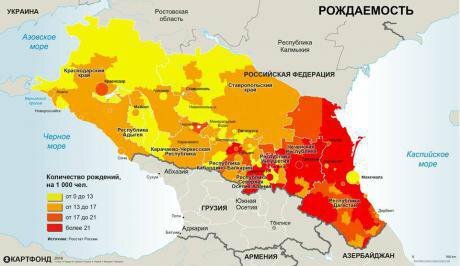 Source: Vkontakte.Kartfond’s recent series of maps “Demographic Trends in the North Caucasus” show that in the east of the region – Chechnya, Ingushetia and Dagestan – the birth rate is higher and the death rate lower than average. Is this connected with local traditions, or do state programmes to stimulate childbirth work better in republics with a high unemployment rate? Does this dynamic lead to mass migration to other areas and, as a consequence, interethnic tension in the region? 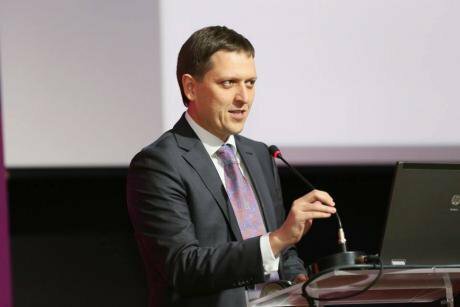 I talked about this to Aleksandr Panin, a senior research fellow at Moscow State University’s Faculty of Geography and a managing partner of Kartfond. 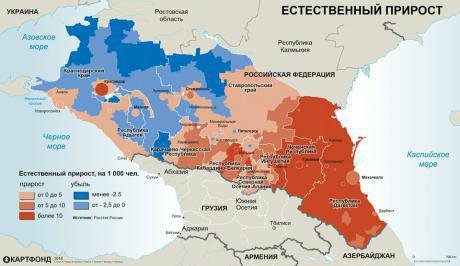 Here, Panin analyses new maps of the region, published in February, and explains that the North Caucasus republics actually have an increasingly aging population. If the authorities are going to halt the process of youth migration, creating a more pleasant and comfortable environment in urban centres will be key. We are looking at charts of birth rates, death rates and the natural growth of the population in this region. How important are they? What you see on the table is only a small sample of our maps. But even they can show how the regions of the Caucasus vary and how difficult it is to develop a single spatial development strategy for all its different areas. Can we trust the figures that the research is based on? Rosstat, Russia’s Statistics Agency, has often been criticised for the lack of objectivity in its published figures. We base our maps on municipal statistics. The demographics are accurate in terms of births and deaths, as these require the issue of official certificates. But there are a lot of questions around other figures. In the first place, Rosstat took a long time to perfect its data collection processes. The agency is still a “Soviet Mammoth”, unable to adapt to reality and implement the up to date methodology we need to measure our population. Secondly, Rosstat first forgot how to count accurately and then eliminated whole categories of indicators, which are essential for managing a multiethnic region. Map of natural population growth in the North Caucasus. Source: Kartfond / Facebook. All rights reserved.In 2001, for example, the agency stopped registering ethnicity in natural population movement. And in 2007 Rosstat lost the figures on the nationalities of people migrating. And that year was the last time that we compiled maps of ethnic-based migration: maps telling us, for example, how many ethnic Russians were leaving eastern Stavropol and what the city’s ethnic mix should look like ten years later. Now we don’t have these figures and we – researchers, experts – have to look for other sources of information: rural household registers, social networks, BigData and so on. I’ve no idea if this a good thing or not. Can we talk about the influence of ethnic specifics on childbirth? Do areas with a population increase tend to be mono-ethnic or poly-ethnic? 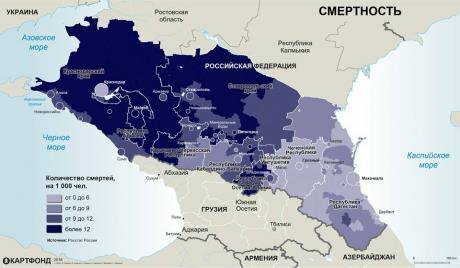 In terms of demography, the Caucasus can be divided into the wealthy east, which is multi-ethnic, and the poor west, which has a larger Russian population. But the frontier between the two is in constant movement – by 10 kilometres a year in a north-western direction, according to our calculations. Over the last 20 years we have seen a gradual change in the ethnic composition of the population. It has happened in stages. We’ve already mentioned the eastern districts of Stavropol. Now we’re looking at the large cities of the North Caucasus (including their suburbs) – Krasnodar, Stavropol and the Caucasian Mineral Spring towns. Does this mean an increased risk of inter-ethnic conflicts? Of course. And no one knows how to avoid it. There’s nothing wrong with the ethnic composition of the population changing – it’s a normal process. The problem is that our local authorities are unwilling to work with people who migrate. The worst place in that regard is the east of Stavropol, but now cities in the Caucasus Mineral Spring area are also affected, especially Pyatigorsk. It’s worth saying that the roots of conflict aren’t, of course always ethnic. Questions of land use in the Caucasus, for example, are very badly regulated, and there is hardly any transparency there. Pasture boundaries often get extended to the detriment of neighbouring landowners, for example, which can spark conflicts. So in practice they are economic clashes, not inter-ethnic ones. Chart of birth rates in the North Caucasus. Source: Kartfond / Facebook. All rights reserved.The authorities try to stand back from the problems, sending the Cossacks in to fix them, for example. But we need to take a close look at the system of measuring migration, and develop a strategy to include migrants in urban life, to take a variety of approaches to the issue. Is a high birth rate connected to any ethnic factors? Or do social initiatives stimulate an increase in fertility? I’m referring to “maternal capital”, the scheme to subsidise young families with one or two children. Ethnic reproductive traditions and government efforts over the last few years are, of course, having a positive effect on natural population movement. But we must remember that at the point when “maternal capital” kicked in (the early 2010s), people born in the 1980s, a decade with a high childbirth rate, were entering their childbearing years. And we also mustn’t forget that, in the North Caucasus, a high birth rate in the past has produced one of the highest percentages of young people in the whole of Russia. Many of them are keen to have second and third children, and this also raises the demographic figures of their home cities. The demographic potential of the North Caucasus is nonetheless in decline. And it can’t go on forever supplying labour for other Russian regions, as it has done in the past. We see today a totally predictable decline in the birth rate across Russia, including the North Caucasus. Each year, fewer and fewer couples choose to have a large family. The lower birth rate is already visible in North Ossetia, Kabardino-Balkaria and Karachayevo-Cherkessia, and there is no doubt that it will start falling in other parts of the North Caucasus. It is often said that an increase in prosperity is needed to improve Russia’s demographic situation. But judging by your maps, a high birth rate coincides with areas of poverty and high unemployment. Increasing the living standards of Russians is a priority, irrespective of what demographic or other maps tell us. And that would of course have an immediate positive effect on life expectancy, the death rate and so on. But where childbearing is concerned, global, and now also Russian figures show that there is no clear correlation between income levels and birth rates. The most economically developed cities in Kuban, for example, are located in a depopulated area, as can be seen from the gradations of blue on the map below. If we look at regions in Central Russia, we see a similar picture. Take the highly developed Kaluga and Belgorod regions, for example: the trends are the same. They have strong government and excellent social policies, but their population is declining before our very eyes. Is the opposite also true – do rising living standards lead to a lower birth rate? There is a similar situation in Europe, where birth rates among the indigenous populations are falling like mad. But the main reason behind this is the changing role of women, a change that is also affecting us in the North Caucasus. Nowadays it’s very difficult to persuade young couples to have three or four children. And it’s not a question of benefits or lack of them, but the fact that women want to have a life outside their husband’s flat. These changes can also be seen in the eastern part of the North Caucasus – in Dagestan, Chechnya and Ingushetia. Can we call this process “Europeanisation”? Yes, that demographic process is well documented. Social structures and behavioural stereotypes are changing. Can the state do anything to halt the depopulation of the region? I feel that the state has a lot of room here for work and creativity. There’s nothing to stop it creating interesting new work opportunities and the user-friendly innovative environment that our young people need so badly. And wherever you get lots of young people, the marriage statistics inevitably rise – look at Krasnodar, for example. We’re now at the stage where the large cities and their suburbs are madly sucking rural communities into their spheres of influence. The main beneficiaries of this are low-cost housing developers. “Urbanist ghettos” have sprung up in most flourishing cities in southern Russia – these places could be cited in architectural textbooks as good examples of how not to build houses. Chart of death rates in the North Caucasus. Source: Kartfond / Facebook. All rights reserved.The cities of the Caucasus are still not prepared for the scale of this population migration in terms of either infrastructure or institutions. As a result, instead of gradually developing a pleasant urban environment while aiming for high standards in public services and amenities, the local authorities have surrendered to the developers (Makhachkala is a prime example). So what we get are hideous high rise housing estates that often don’t just contravene planning regulations but fly in the face of common sense. For the record: for the last 40 years, in European countries, residential buildings usually haven’t been more than seven stories high, and most development conforms to a gridiron pattern, rather than tower blocks in a park-style layout. Here, it’s just the opposite. The builders have dug out extravagant blueprints conceived by Soviet architects, modified them to reduce the cost to as little as possible and are now attempting to shoehorn them into a modern cityscape. But one of the functions of the Soviet city was to breed a Soviet citizen: a person who lived in one place (a dormitory suburb), worked in another (usually in an industrial zone) and took their leisure somewhere else again. Buildings were planned at a distance from one another, so that Soviet cities rarely had any mixed-use development. As a result, a Soviet citizen usually had to expend considerable time and energy on his or her commute to work, and had no decent services within walking distance from their home. The surroundings of these dormitory zones are usually ugly, unattractive, and inconvenient. And most crucially, residents can’t feel that their open space belongs to them. So our cities have become inconvenient places to live: inconvenient for work, rest and play. But it’s even worse in rural areas, so even an “inconvenient city” is a magnet for the rural migrant. Although, this too loses its attraction after a time. Do people from the Caucasus move still further away? Yes, migration is a gradual process. People move from a village to a district centre, then to a larger town, then to their republic’s capital and eventually to Moscow, St Petersburg and so on. People living in villages and small towns lack services, both in terms of their basic needs – accessible health services, schools, shops, roads and so on – and more evolved facilities such as coffee shops, hairdressers, petrol stations etc. Everything that makes life more comfortable. Young Dagestanis can’t find these in Kizlyar, for example, so they move to Makhachkala. And if Makhachkala doesn’t have the amenities they need, they’re off to Moscow. It’s not enough to build a factory or holiday resort and wait for the area around it to come to life on its own. You need some town planning. But the people in charge in the North Caucasus still haven’t grasped that. It’s not yet very obvious on the maps, but the demographic situation in Dagestan is worsening. The birth rate is falling and outward migration is growing, so the population’s age structure is changing. Young people are leaving. If the regional government is really worried about an aging population and demographic decline, the urban environment issue has to have the highest priority. There are now debates taking place over what should be developed – towns or villages. What would be better for the demographic situation? There is in fact no contradiction between these two approaches: we need both. But we need to realise that people want to live where there is movement and scope for development. Dagestan’s mountain villages have excellent tourist potential, for instance. But the question is, how many do we develop, and which ones? There is no one to provide a considered answer. Every year projects to develop the mountain areas are announced, but we haven’t noticed anything happening. Many investment projects initiated in the Caucasus quote grandiose figures – great statistics – but provide work for only a small number of people, and most of these have specific skills and experience. They also come from other regions, since none of the locals have the appropriate specialisations. So you end up with just a few dozen local people getting work. The problem is that these cornerstone investment projects turn out in practice to be not so cornerstone as all that and have no multiplicative effect: they don’t, in other words, provide a trigger for complementary sectors. All these large projects work in a highly specific way that excludes the local populace. They are not even mentioned in the master-plans for these projects. In France, for example, there are no projects for the development of ski resorts. There is, instead, a programme for mountain areas, including both villages and small towns, which are ripe for tourist development. This approach could also work for the Caucasus: first we develop the area, then the big projects will come to us. There is already a certain movement in this direction: over the last few years the North Caucasus has been improving its roads and general transport infrastructure. And it would be logical to assume that this will trigger new business opportunities. In economic and investment terms, the North Caucasus is still insufficiently studied and understood, and needs the development of complex programmes to open up its potential. The Russian government is still just getting its head round the socio-economic specifics of the region and still hasn’t grasped the multiplicity of its character. For a long time, it seemed as though all the issues could be resolved via economic means – you build the factories and resorts, and everything will burst into life. But that approach failed: the problems of the North Caucasus need a much more complex solution.